Sally Eldeghaidy is an Anne Mclaren Research Fellow in Sensory Science, and a member of the Future Food Beacon of Excellence. 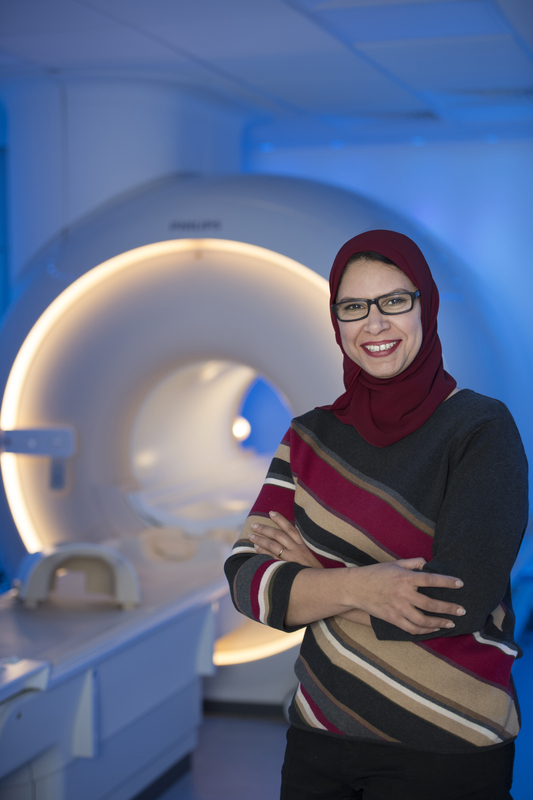 Sally uses functional magnetic resonance imaging (MRI) to understand neural mechanisms involved in food intake, food choice and consumption. She focuses on understanding the sensory-brain-gut interactions in the regulation of food intake to tackle obesity, and the effect of taste phenotype and genotype on taste and flavour perception. Previously, Sally was a Research Fellow in the School of Physics at the University of Nottingham. In this interview, Sally talks to Lexi Earl about her work, research interests, and plans while with the Future Food Beacon. Tell us about yourself and your research? I am an MR physicist. I graduated in Physics at Suez Canal University, Egypt. In 2009, I obtained my PhD at the Sir Peter Mansfield Imaging Centre (SPMIC) in a multi-disciplinary project bridging MR Imaging techniques with food sciences. 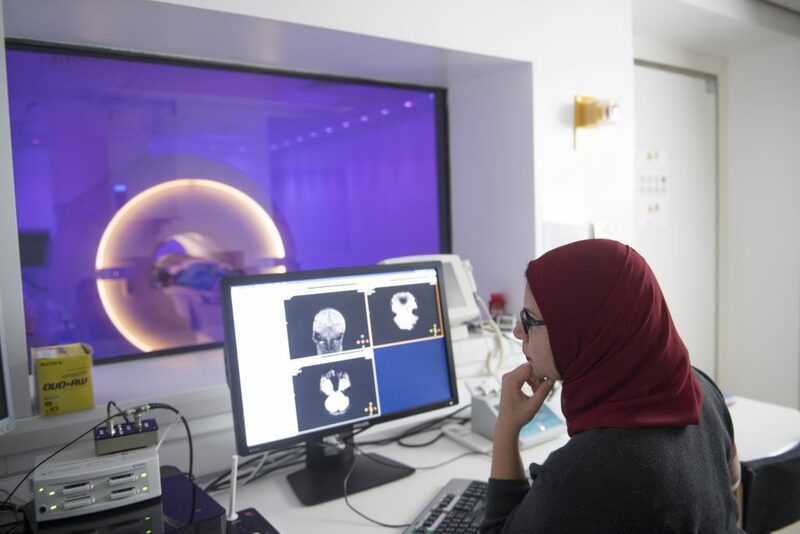 My research focuses on optimising non-invasive MRI images and developing analysis methods to understand the physiological mechanism involved in food intake, food choice and consumption. 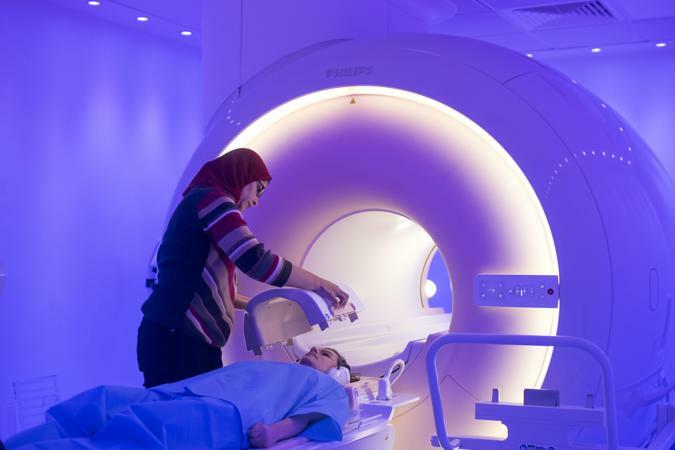 This includes functional MRI to study the brain’s perception to taste, aroma, flavour and oral fat emulsions; the physiological mechanism involved in satiation through brain-gut interactions; and the effect of taste phenotype and genotype on food perception, preference and choice. Following my PhD I worked as an Assistant Professor of Physics in Egypt for four years. In 2014, I rejoined the SPMIC to investigate how different tastes are represented in the primary gustatory cortex “gustotopic mapping”, using high resolution fMRI at ultra-high field (7T). This extended to understand how gustotopic maps differ with individual variation in taste phenotype and genotype (PROP and thermal taste). I also investigated the brain’s response to phantom taste elicited in some individual “thermal tasters” when their tongue is thermally stimulated. Building on my previous research, I am currently optimising MRI techniques to combine brain and gut imaging in a single MRI scan session. How did you become interested in the idea of mapping food in the brain? I was always interested in studying the human brain, because it is such a black box. The human brain is a highly complex organ, and the recent development in imaging techniques provides new insights on the brain structure and function. My journey in studying the brain started by investigating the brain perception to visual stimulation in Egypt, however this was limited to animal studies using electrophysiological recording (EEG) rather than imaging techniques due to the limited research facilities. When I joined the SPMIC for my PhD studies, I investigated the auditory perception in the human brain using simultaneous recording of EEG and fMRI. I then moved into understanding food-related brain perception using fMRI. It is a very interesting and challenging area to study. Is there anything particularly interesting you’ve found around food and the brain? The more I do, the more I find interesting. I have learnt a lot through collaboration with sensory and food scientists. It is not just about how people perceive taste, it is more about how people are different – supertasters and non-tasters; thermal tasters and non-thermal tasters or, as I have recently learned, sweet likers and fat likers. Using brain imaging to understand individual variations in food perception is novel, and the fMRI group in Nottingham is world-leading in this area, hence a fascinating area to explore. There is a lot more to research. I am very interested in using imaging techniques to understand the individual variability in food perception, why people taste foods differently, and how the brain reacts to this. All the areas I’ve worked on are novel. This has provided me with a fertile environment for further research which aims to enrich our understanding of food perception. My current research is exploring this further through combining brain and gut imaging with sensory perception and taste phenotype to underpin the real drivers for food intake. Combining brain and gut imaging in a single MRI session is a novel technique that will enhance our understanding of the physiological mechanism of appetite and satiety in healthy and obese participants, and will pave the way to treatment and prevention. Is there any particular reason why you wanted to join Future Food? Joining the Future Food Beacon has been highly beneficial to my career. For example, I was allowed the opportunity to develop my own research, bridging food sciences and nutrition with the world leading state-of-the-art MR Imaging techniques at the SMPIC, which will allow me to establish myself as an independent researcher nationally and internationally. I work with a great team at the SPMIC. They are always inspiring me around what to do, they are always looking for what is new. Working at the Sir Peter Mansfield Imaging Centre is in itself a great motivator. At his funeral, the words that really spoke to me were about the legacy he had left. When you think about the MRI discoveries and techniques he left after he passed away, how much they help different people, in medical fields and others… I would love to do something that will help people in the future; seeing how you can use science to help people – it is not just something you do as your job. That is my inspiration. I’ve had a very rewarding academic career so far, with several exciting moments. Some relate to research results, and some relate to the interaction with other academics and students. My favourite moment was when my research first got accepted for publication, and I witnessed the impact of my research on the scientific community and general public. Be open minded. Work hard. Focus. Be patient. Keep looking forward. Don’t give up. I walk my dog in the morning and then I head to work. I have a normal academic life. My dog has forced me to get off my laptop more frequently, and get some fresh air. How would you explain your research to an ordinary person? My research focuses on using non-invasive MR imaging techniques to understand food perception and intake in the brain; why people taste foods differently and how the brain reacts to this. How do you think your research will affect ordinary people? The mechanism of neural interactions between sensory (mouth), brain and gut in the regulation of food intake is complex and remains poorly understood in obese individuals. To date, no study has assessed the whole picture of food intake (mouth, brain and gut interactions), and researchers have been looking at bits and pieces. Dietary fat is a fundamental contributor to the selection of food largely due to its pleasant sensory characteristics. Consequently, high fat foods are often over eaten leading to weight gain. Understanding the sensory-brain-gut interactions in response to a fat meal, will help inform the reformulation of reduced-fat foods that mimic the brain’s response to high-fat counterparts and guide future interventions to reduce obesity. I will develop and apply imaging techniques to investigate the neural connection between the brain and gut in obese cohorts and normal weight controls, and correlate these measurements with taste phenotype. The outcome from this research will provide a step forward in understanding the physiology of food intake, food choice and consumption, and understanding individual variations in food perception, and alterations with obesity and in clinical conditions. The developed imaging techniques have the potential to be used as experimental tools to validate new food ingredients and evaluate the efficacy of palatable nutritious food, thus informing foods’ industrial product design. The technique is providing platform technology to evaluate the efficacy of dietary, behavioural and pharmacological interventions in obese and non-obese patient cohorts.